SNES Super Mario World 2: Yoshi's Island (USA v1.0) "100%" in 1:59:35.12 by Baxter, Carl Sagan & NxCy. 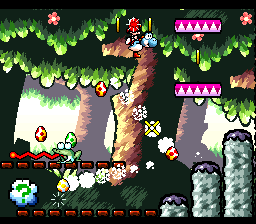 Super Mario World 2: Yoshi's Island is a vibrant, colorful and fun game that stars the popular Yoshi. From a technical standpoint, the game is very exceptional on the SNES due to its use of the SuperFX² coprocessor. The chip allows for many cool special effects that are otherwise impossible on the SNES. This is a 100% completion of the game. It plays through all the levels and collects every item that contributes to end-of-level score: 5 flowers, 20 red coins, and 30 stars. By getting 100% completion in each stage, six extra stages are also unlocked. These are played at the end of the run, again with 100% scores. The authors of the run have spent over three years working on this run, showing off plenty of egg juggling, precise shots, and other incredible antics. This run does not use certain glitches present in the other runs of the game (an any% run and a warp glitch run), but there should still be plenty to surprise you. Reading the authors' lengthy comments is recommended.